Goldman Sachs Group Inc. (GS - Get Report) opened at $207.00 Friday morning. A close Friday above its 200-day simple moving average at $209.13 would have favored a breakout on Monday (for the record it was $207.84 by end-of-day Friday). But if you bought at the lows, consider reducing holdings. Goldman reports quarterly earnings before the open on Monday, April 15. The stock has tested its 200-day and 200-week simple moving averages at $209.13 and $207.63, respectively, this morning. The stock has also tested its quarterly and semiannual pivots at $206.18 and $208.03, respectively. A positive reaction to earnings that causes a gap above these four levels at Monday's open will be considered a technical breakout. Without a breakout, the downside is to my annual value level at $186.87. Traders have a choice! Bet on a breakout or trade the range. Goldman Sachs is a member of the Dow Jones Industrial Average and was the worst performing stock in the average for 2018. Goldman closed Thursday at $202.83, up 21.4% year to date and in bull market territory, 33.7% above its Dec. 26 low of $151.70. This bull market is a consolidation of the bear market decline of 26.3% from its all-time intraday high of $275.31 set on March 12, 2018. Goldman is reasonably priced with a P/E ratio of 8.04 and a dividend yield of 1.58, according to Macrotrends. The Goldman Sachs Bank USA is monitored by the Federal Deposit Insurance Corporation and the Quarterly Banking Profile for the fourth quarter shows that the bank has $191.6 billion in total assets. This is up from $179.3 billion shown in the third quarter QBP. This should be a positive indication for the company when they report earnings before the opening bell on Monday. Analysts expect Goldman to earn $5.05 per share and they have beaten estimates for seven quarters in a row. During testimony before the House Committee on Financial Services earlier this week, CEO David Solomon indicated that his firm never had plans to open a cryptocurrency trading desk, which was an industry rumor. Goldman will be one of the lead underwriters of the upcoming Uber initial public offering. Goldman is also one of the Primary Dealers who have business relationships with the New York Federal Reserve Open Market Trading Desk, so they put their firms' capital at risk as underwriters of new U.S. Treasuries. 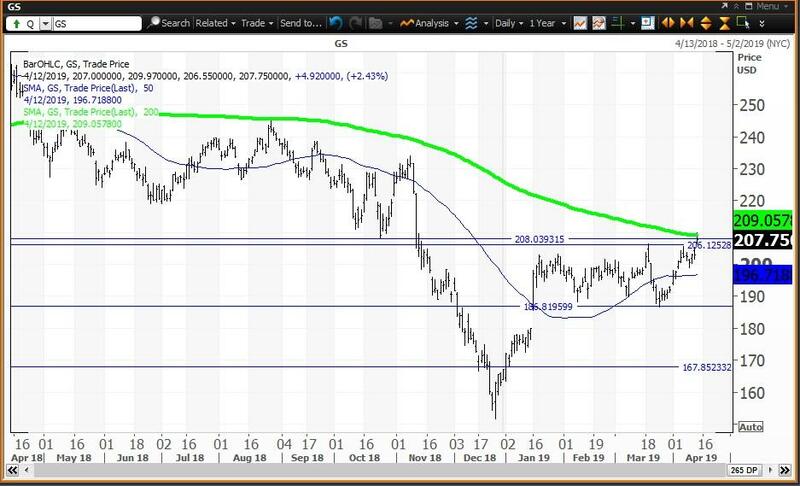 Goldman had been below a "death cross" since May 29, 2018 when the 50-day simple moving average declined below the 200-day simple moving average, indicating that lower prices would follow. The close on May 29 was $227.03. This signal was in play until the stock closed at $162.03 on Dec. 26, which proved to be a "key reversal" as the Christmas low of $151.70 was set on Dec. 26 and the close was above the Dec. 24 high of $160.00. The stock closed Dec. 31 at $167.05, which was an important input to my proprietary analytics. Its annual value level at $186.87 is the low end of a trading range. Its semiannual risky level, now a pivot, is $208.03. The 200-day simple moving average was $209.13 on Thursday. The close of $191.99 on March 29 was another important input to my analytics and this established its monthly value level at $167.87 and quarterly pivot at $206.18. 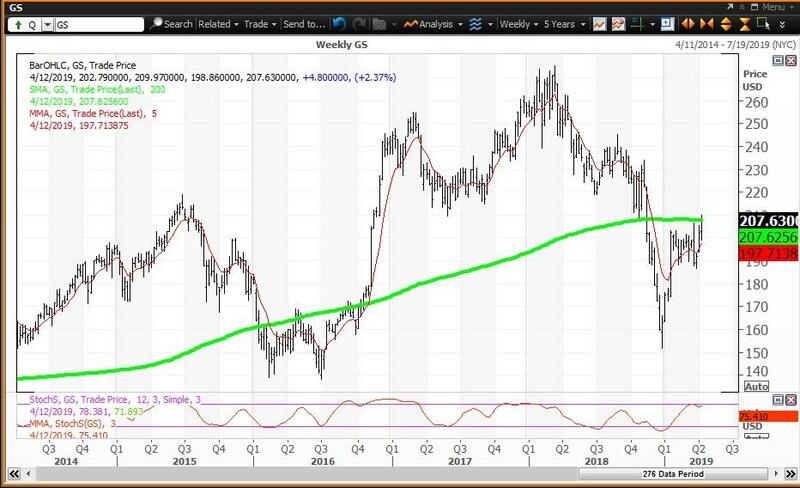 The weekly chart for Goldman is positive since Friday's close was above its five-week modified moving average of $197.81 and above its 200-week simple moving average or "reversion to the mean" at $207.63. The 12x3x3 weekly slow stochastic reading is projected to end this week at 75.76, up from 73.93 on April 5. Helping the rebound is the fact that at the Christmas low, this reading was 6.32, well below 10.00, which is my indication that the stock was "too cheap to ignore." Trading Strategy: If you have been long Goldman Sachs and trading the range, it's time to reduce holdings with the stock between its quarterly pivot at $206.18 and its 200-day simple moving average at $209.13. In-between are my semiannual pivot at $208.03 and its 200-week SMA at $207.63. If you are a range-trader, book profits and buy weakness to its annual pivot at $186.87. If you are betting a breakout post-earnings, the bet is to buy the stock within the zone of four levels stated above. Value levels and risky levels are based upon the last nine weekly, monthly, quarterly, semiannual and annual closes. The first set of levels was based upon the closes on Dec. 31. The original semiannual and annual levels remain in play. The weekly level changes each week; the monthly level was changed at the end of January, February and March. The quarterly level was changed at the end of March. My theory is that nine years of volatility between closes are enough to assume that all possible bullish or bearish events for the stock are factored in. To capture share price volatility, investors should buy on weakness to a value level and reduce holdings on strength to a risky level. A pivot is a value level or risky level that was violated within its time horizon. Pivots act as magnets that have a high probability of being tested again before its time horizon expires. My choice of using 12x3x3 weekly slow stochastic readings was based upon back-testing many methods of reading share-price momentum with the objective of finding the combination that resulted in the fewest false signals. I did this following the stock market crash of 1987, so I have been happy with the results for more than 30 years. The stochastic reading covers the last 12 weeks of highs, lows and closes for the stock. There is a raw calculation of the differences between the highest high and lowest low versus the closes. These levels are modified to a fast reading and a slow reading and I found that the slow reading worked the best. The stochastic reading scales between 00.00 and 100.00 with readings above 80.00 considered overbought and readings below 20.00 considered oversold. Recently I noted that stocks tend to peak and decline 10% to 20% and more shortly after a reading rises above 90.00, so I call that an "inflating parabolic bubble" as a bubble always pops. I also call a reading below 10.00 as being "too cheap to ignore."